Grapes: 80% Sangiovese, 10% Merlot, 10% Cabernet Sauvignon. 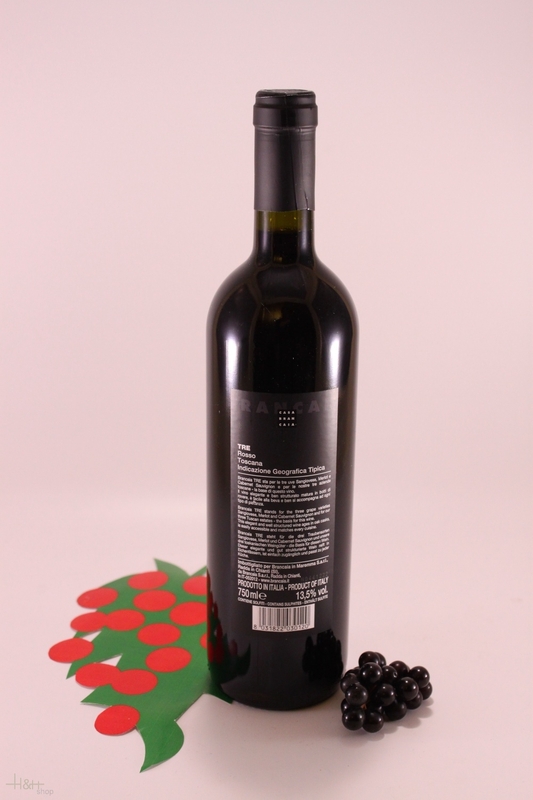 Characteristics: Brancaia TRE is a wine full of character giving you drinking pleasure already at the moment of release. The carefully selected grapes are our three estates Brancaia, Poppi and our estate in the Maremma: Brancaia in Maremma. The blend of Sangiovese, Merlot and Cabernet Sauvignon is aged for 12 months in Tonneaux. "Wine Spectator" has rated the wine "Brancaia Tre Toscana IGT, Tuscany, Italy" the vintage 2014 on 15.10.2016 with 89 of 100 points. "Wine & Spirits Magazine" has rated the wine "Brancaia Tre Toscana IGT, Tuscany, Italy" the vintage 2013 on 01.04.2016 with 86 of 100 points. "Wine Spectator" has rated the wine "Brancaia Tre Toscana IGT, Tuscany, Italy" the vintage 2013 on 31.10.2015 with 89 of 100 points. "Wine & Spirits Magazine" has rated the wine "Brancaia Tre Toscana IGT, Tuscany, Italy" the vintage 2012 on 01.04.2015 with 86 of 100 points. 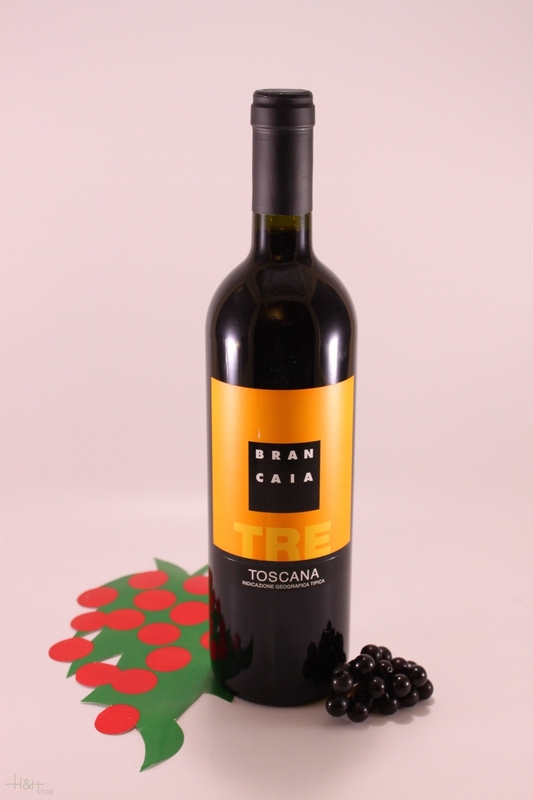 "Wine Enthusiast" has rated the wine "Brancaia Tre Toscana IGT, Tuscany, Italy" the vintage 2012 on 08.01.2015 with 86 of 100 points. "Wine Spectator" has rated the wine "Brancaia Tre Toscana IGT, Tuscany, Italy" the vintage 2012 on 31.10.2014 with 88 of 100 points. "Wine Enthusiast" has rated the wine "Brancaia Tre Toscana IGT, Tuscany, Italy" the vintage 2011 on 05.01.2014 with 86 of 100 points. "Wine Spectator" has rated the wine "Brancaia Tre Toscana IGT, Tuscany, Italy" the vintage 2011 on 31.10.2013 with 86 of 100 points. "Vinous Antonio Galloni" has rated the wine "Brancaia Tre Toscana IGT, Tuscany, Italy" the vintage 2010 on 01.09.2012 with 89 of 100 points. "Wine Spectator" has rated the wine "Brancaia Tre Toscana IGT, Tuscany, Italy" the vintage 2008 on 31.10.2010 with 87 of 100 points. "Vinous Antonio Galloni" has rated the wine "Brancaia Tre Toscana IGT, Tuscany, Italy" the vintage 2007 on 01.10.2010 with 90 of 100 points. "Vinous Antonio Galloni" has rated the wine "Brancaia Tre Toscana IGT, Tuscany, Italy" the vintage 2008 on 01.07.2010 with 88 of 100 points. "Wine Spectator" has rated the wine "Brancaia Tre Toscana IGT, Tuscany, Italy" the vintage 2007 on 31.10.2009 with 93 of 100 points. "Vinous Antonio Galloni" has rated the wine "Brancaia Tre Toscana IGT, Tuscany, Italy" the vintage 2006 on 01.08.2009 with 88 of 100 points. "Wine Enthusiast" has rated the wine "Brancaia Tre Toscana IGT, Tuscany, Italy" the vintage 2006 on 11.01.2009 with 89 of 100 points. "Wine Enthusiast" has rated the wine "Brancaia Tre Toscana IGT, Tuscany, Italy" the vintage 2005 on 11.01.2009 with 88 of 100 points. "Wine Spectator" has rated the wine "Brancaia Tre Toscana IGT, Tuscany, Italy" the vintage 2006 on 30.09.2008 with 89 of 100 points. "Wine Spectator" has rated the wine "Brancaia Tre Toscana IGT, Tuscany, Italy" the vintage 2005 on 31.10.2007 with 86 of 100 points. "Falstaff Magazin" has rated the wine "Brancaia Tre Toscana IGT, Tuscany, Italy" the vintage 2004 on 03.11.2006 with 89 of 100 points. "Wine Spectator" has rated the wine "Brancaia Tre Toscana IGT, Tuscany, Italy" the vintage 2004 on 31.10.2006 with 88 of 100 points. "Falstaff Magazin" has rated the wine "Brancaia Tre Toscana IGT, Tuscany, Italy" the vintage 2003 on 30.12.2005 with 89 of 100 points. "Wine Spectator" has rated the wine "Brancaia Tre Toscana IGT, Tuscany, Italy" the vintage 2003 on 31.10.2005 with 88 of 100 points. "Wine Spectator" has rated the wine "Brancaia Tre Toscana IGT, Tuscany, Italy" the vintage 2002 on 31.10.2004 with 87 of 100 points. "Falstaff Magazin" has rated the wine "Brancaia Tre Toscana IGT, Tuscany, Italy" the vintage 2001 on 02.01.2004 with 87 of 100 points.